An insufficient tear production or a change in its composition affects the cells of the cornea and conjunctiva. They become damaged or may even die due to being starved off nutrients and oxygen. The same situation can occur after eye surgery or injury to the ocular surface. All cases give rise to red, burning or itching eyes or a painful foreign body sensation. The treatment of an irritated ocular surface requires intensive lubrication as well as rapid regeneration of the damaged tissue. 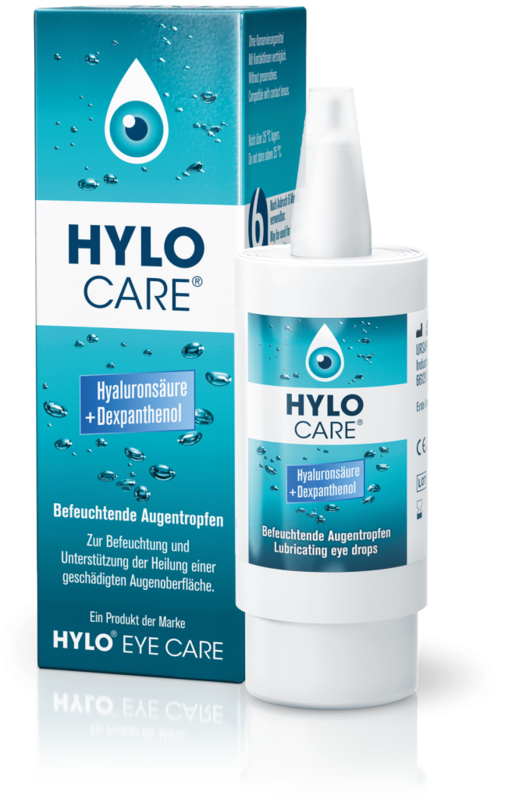 HYLO CARE® contains the naturally occurring endogenous sodium hyaluronate, which is ideally suited as a long-lasting, intensive ocular lubricant. Due to its chemical structure, sodium hyaluronate binds and retains many times its own weight in water. It adheres perfectly to the ocular surface and forms a uniform and stable film that keeps the eyes lubricated. In addition, HYLO CARE® contains the substance dexpanthenol, also known as provitamin B5 that acts as an additional lubricant. Therefore, ideal conditions are generated for a rapid recovery of the injured cornea. Preservatives, which are designed to prevent contamination of eye drops during storage and use, can affect the natural tear film and damage the cells of the ocular surface. Furthermore, they can cause intolerance reactions¹. Modern ocular lubricants are therefore preservative free. This also applies to HYLO CARE® as it is provided in the patented COMOD® multi-dose device that, in a unique way, prevents contamination of its contents. Phosphates that are widely used in eye drops can also have a harmful effect on an already damaged cornea². The binding of phosphate to calcium, which is released from damaged corneal cells, may lead to the formation of sparingly soluble calcifications that can permanently impair vision. Therefore, eye drops used on a dry and damaged ocular surface should not contain phosphates. HYLO CARE® is phosphate free and therefore presents no risk of corneal calcification. 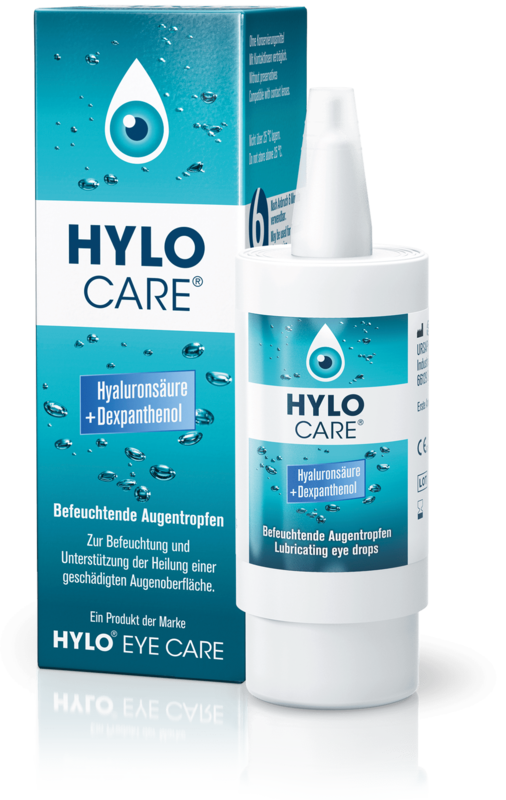 HYLO CARE®: When an intensive therapeutic care of the eyes is required but eye ointments are not an option!